The global economy is "here" and "done," President Obama said Wednesday — the question now is under what terms it will be shaped. "Integration of national economies into a global economy, that's here, that's done," Obama said. 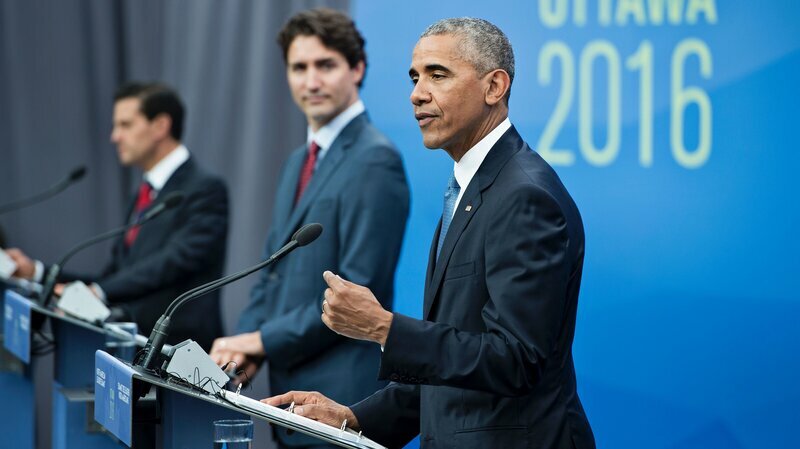 Speaking on the second day of a stock market rally, which came after sharp drops following Great Britain's vote to leave the European Union, Obama said it was important not to draw analogies to what happened with Brexit with trade relations between the U.S., Mexico, and Canada. Obama said ordinary people with concerns about global trade "have a legitimate gripe with globalization." But he cautioned that withdrawing from trade deals such as NAFTA, as Trump, the presumptive Republican presidential nominee has threatened, "is the wrong medicine for dealing with inequality." Notice the two prominent antichrist candidates at the press conference.